French Quarter Festival: A Celebration of the Unique and Vibrant Culture of New Orleans. *This post was updated in February 2019! Every spring for French Quarter Fest, nearly 2,000 musicians come together to perform on dozens of separate stages across the French Quarter and on the Mississippi Riverfront. Over the course of four days, thousands will gather in the French Quarter to celebrate the unique and vibrant culture of New Orleans' most famous neighborhood. 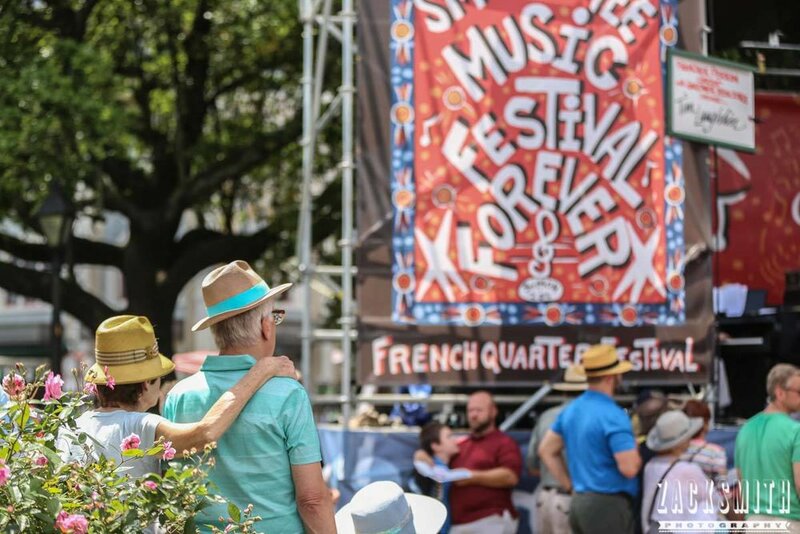 Did we mention admission to French Quarter Fest is completely FREE and open to the public? Over 20 stages will be placed throughout the French Quarter, with over 1,700 Louisiana musicians and more than 170 Louisiana acts being featured. Genres will include anything and everything: traditional and contemporary jazz, rhythm and blues, Cajun and zydeco, New Orleans funk, classical, swing, rock, and international sounds. Major headliners in the past have included Aaron Neville and Irma Thomas. Local favorites like Ellis Marsalis, the Dixie Cups, Jeremy Davenport and Big Sam’s Funky Nation are almost always in attendance. Check out the complete line up. In addition to the incredible live music, the event will host dance lessons, parades, art shows and more. French Quarter fest will kick off with a Second-Line parade through the French Quarter! Other interesting special events include Let Them Talk: Conversations on Louisiana Music, which hosts discussions on all things new and/or noteworthy in music. The speakers and topics are alway interesting and relevant. For example, Irma Thomas, the Queen of New Orleans Soul, has been a featured guest in the past! Only bring the essentials in a light day bag: sunscreen, a hat, a folding chair or blanket. Springtime in New Orleans is normally pretty warm with lows around the low 80's, so be sure to wear loose, comfortable clothing. Bring your dancing shoes! Make sure they're comfortable though as French Quarter Fest is spread out, so you’ll be walking and standing for long stretches. Be sure to hydrate with lots of water! 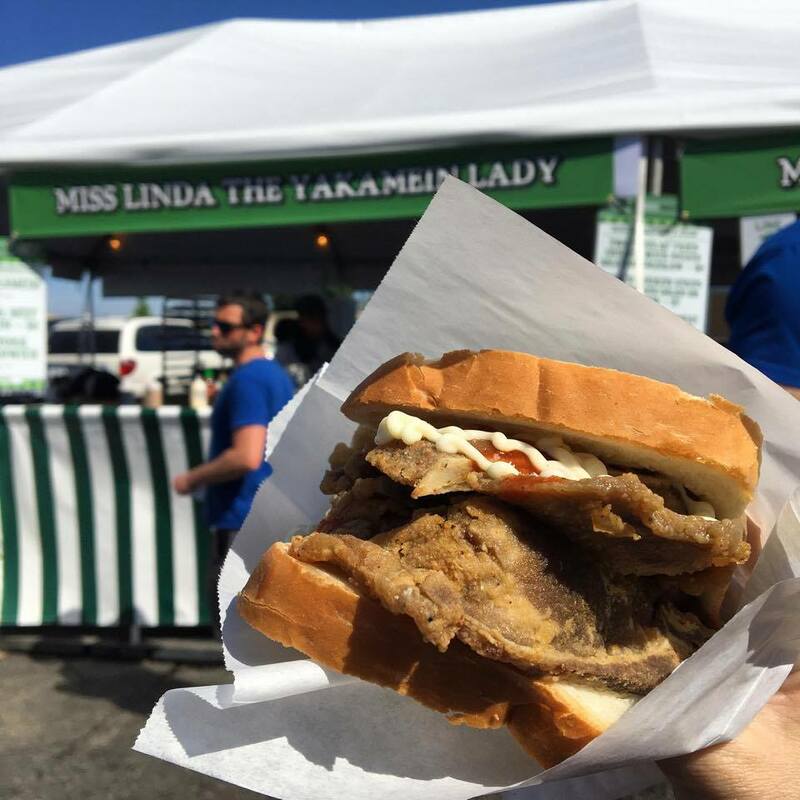 Although admission to the festival is free, be sure to bring some cash for festival food and drinks (ATMs will be located throughout the French Quarter). Getting to French Quarter Festival is easy, but parking can challenging. Arrive early to park in these lots located in the heart of the festival: French Market, 500 Decatur Street, 300 North Peters Street, 211 Conti Street, Canal Place and various locations within walking distance. Or take public transportation down to the Quarter to avoid the hassle of parking. Walking is the best way to get around FQF. The French Quarter turns into a pedestrian mall for FQF, so it will be impossible to get a cab or an Uber. Pedicabs will be available if you're looking for a quick way to get from one side of the Quarter to the other. It's best to have a plan to ensure that you will be able to see as much as possible. We recommend starting in Jackson Square to take in some traditional New Orleans jazz and food! Walking through the festival, you will hear music at almost every corner. Stop and take in some of the acts on the smaller stages - you will not be disappointed! French Quarter Fest might be known for the music, but it is just as much as food festival! There will be more than 60 food vendors on site serving some of the best, most mouth-watering New Orleans cuisine. Check out the full list of food vendors here. Be sure to indulge in traditional New Orleans staples like fried seafood, cochon de lait po-boys, jambalaya, meat pies, snoballs, and Pat O'Brien's Hurricanes! Prices will range from $3-$11. Outside food and beverages are not allowed at festival venues. If you enjoyed this post, let us know in the comments section below and share with someone who might enjoy it as well. Follow us on social media and listen to the Solo Travel Talk Podcast for more affordable luxury solo travel tips, tricks, stories and advice. Click on the links below! Every female solo traveler is different when it comes to exploring a city alone at night. Some are reluctant to leave the comfort of their hotel, others are eager to hit the town, and some want to be out and about, but don’t want to drink alcohol. Our list of 7 things to do at night as a solo traveler in New Orleans has something to suit every preference! A day in New Orleans is not nearly enough, but if you're here traveling solo for a layover or just passing through, 24 hours is enough time to see, eat, and dance your way through key things to do in the Crescent City. Here is Astrid Solo Travel Advisor's guide for a day trip to the Big Easy. Get ready for a good, old fashioned New Orleans block party! Sponsored by Whitey Bank, Whitney White Linen Night is a chance for the Warehouse District, which has distinguished itself as being New Orleans's art epicenter, to show off NOLA’s thriving art scene. While the hot Louisiana summer may deter many tourist from visiting the city, June might not be such a bad time to visit New Orleans. The hotel rates are lower, it’s less crowded, and June is slammed packed with special events, festivals, and concerts. 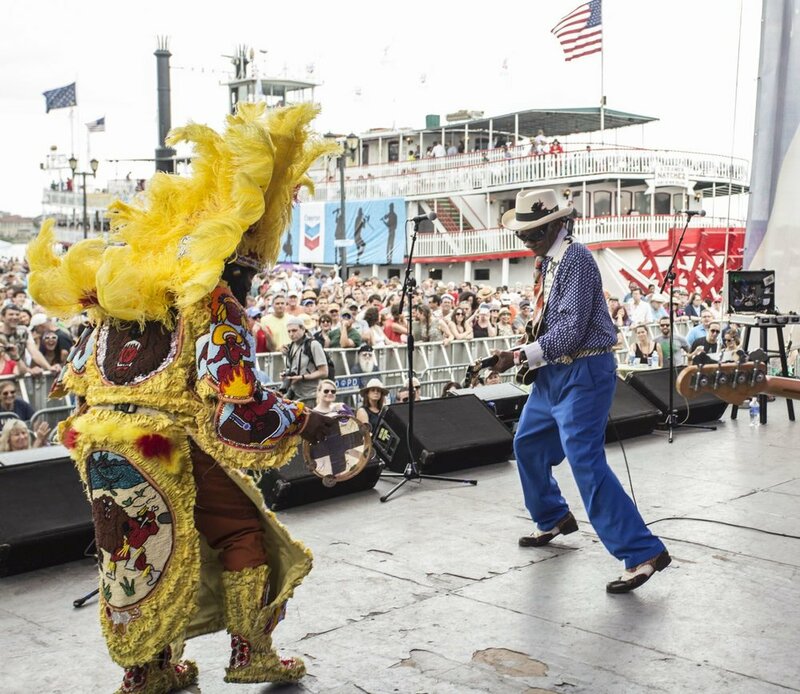 Here are 6 June festivals and events to attend on your next solo trip to New Orleans! New Orleans is a fabulous destination for the solo traveler! I take you on a virtual tour of the Crescent City on my new solo travel podcast--by neighborhood--and give you lots of highlights. As a special twist, I try and share places that you might not always hear about when considering New Orleans travel. Be smart, be aware, and be safe. If you do those things and follow the tips we've detailed for you, solo female travel in New Orleans should be a piece of cake. From Uptown to the Bywater, we will offer solo travel tips, tricks and advice to ensure a trip filled with affordable luxury and fun. Here are our top 15 things to do solo in New Orleans. In celebration of our French heritage, New Orleans will host a wide variety of French-related events on Bastille Day! Ranked the 3rd best Bastille Day festival in the world by Reuters.com, this is one special occasion that is a treat for travelers and locals alike! The Creole Tomato Festival is your chance to get a taste of a local delicacy, along with a myriad of culinary masterpieces that feature this almighty staple of Creole cuisine. This quirky, fun New Orleans festival is a great way to mix up the typical trip to the city! Every year on Memorial Day Weekend, the New Orleans Greek Festival celebrates Greek culture and heritage with traditional food, music, performances and fun for kids and adults alike. This is a great opportunity for the solo traveler to get a taste of a specific aspect of New Orleans culture and heritage. French Quarter Festival is one of the greatest celebrations of the unique and vibrant culture of New Orleans. With nearly 2,000 musicians across all genres of music, delicious local food, and ample amounts of entertainment, all for free, this is a great event for any solo traveler visiting New Orleans this spring! Spend a day strolling down New Orleans' picturesque Oak Street, a Carrollton gem that still retains the turn-of-the-last-century feel of an old Americana Main Street. Looking for things to do in New Orleans in January? Here are our recommendations for fun, exciting events to attend as a solo traveler visiting NOLA in the month of January! While on a solo trip to New Orleans, make sure you check out Royal Street! In our humble opinion, Royal Street is one of the most lovely streets in the city. With ample shopping, noteworthy architecture and entertainment nearly every block, Royal Street will not disappoint! New Orleans is full of fabulous places to find a glass of wine, a bite to eat, and maybe even somewhere to listen to live music. We've found the five best venues to drink wine in New Orleans for solo travelers and wine lovers alike.